An adhesion laminated surface protection film comprises a layered laminate that includes an adhesive layer and a polymer based substrate layer. The layered laminate is manufactured through co-extrusion. The coextruded adhesive layer comprises polyisobutylene on the styrene block copolymer. Adhesion laminated surface protection films are widely being used to prevent abrasion and scratching of products at the time of manufacturing and logistics. These films offer product longevity and are cost-effective when it comes to preserve expensive products. Demand for electronic hand-held devices is witnessing a tremendous upsurge, which in turn necessitate adoption of adhesion laminated surface protection films owing to enhanced quality requirements in display screens. Although at an initial stage, adoption of hybrid laptops is expected to increase significantly in the upcoming years, thereby creating opportunities for adhesion laminated surface protection films in their display and body. Adhesion laminated surface protection films also find extensive use in protection of household interiors from discoloration, and for maintaining the durability of their radiance. Adhesion laminated surface protection films are utilized as complimentary products, with their demand being directly influenced by adoption of substrates in various end-use industries. In addition, robust expansion of the automatic sector, coupled with demand for associated electronic gadgets equipped with flat screen panels will further propel adoption of adhesion laminated surface protection films. Transparency Market Research (TMR) has projected a moderate expansion for the global adhesion laminated surface protection films market in its new report, for the forecast period, 2017 to 2026. Revenues from the market are estimated to exceed US$ 1,700 Mn by 2026-end. Adhesion laminated surface protection films come with various thicknesses, among which 50-100 microns thickness of these films will remain the most lucrative in the global market. Such films are extensively used in construction and heavy duty industries where product damage leads to huge capital losses. In addition, 100-150 microns thickness of adhesion laminated surface protection films are also expected to account for a major revenue share of the market during 2017 to 2026. This thickness range of adhesion laminated surface protection films will witness the fastest expansion through 2026. Wet bond lamination and solventless lamination are anticipated to remain preferred technologies for production of adhesion laminated surface protection films. Revenues from these two lamination technologies are projected to collectively account for over three-fifth share of the market by 2026-end. Dry bond lamination, on the other hand, will remain the least lucrative technology used for producing adhesion laminated surface protection films. With increasing focus on infrastructure improvements in various sectors, particularly in developing countries, construction activities have witnessed a significant rise. In addition, rising disposable incomes of people along with increasing interest in renovating their residential spaces has spurred the investments in activities such as interior designing. These further necessitate protection of surfaces in order to avoid scratches and breakage of floorings or structure. Adhesion laminated surface protection films provide good protection to these structure at affordable costs. Therefore, demand for these films in construction & interior end-use industry will remain the largest, as compared to other end-use industries. Europe will remain the largest market for adhesion laminated surface protection films, followed by Asia-Pacific excluding Japan (APEJ) and North America. Among these regions, APEJ will register a relatively faster expansion in the market through 2026. 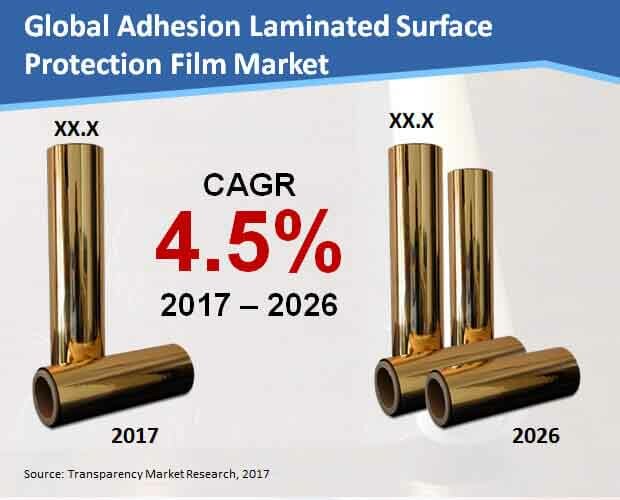 The competition among players in the global adhesion laminated surface protection films market is expected to intensify in the near future, with vendors competing on the basis of factors such as product innovation, increasing investments in R&D and production technologies, and product quality. TMR’s report has profiled proactive players supporting the market growth, which include 3M, Nitto Denko Corporation, Henkel Corporation, Tesa SE, E. I. du Pont de Nemours and Company, Saint-Gobain Performance Plastics, Avery Dennison Corporation, LINTEC Corporation, Intertape Polymer Group, ECHOtape, Scapa Group plc, and Sekisui Chemical Co., Ltd. Recently, Transparency Market Research (TMR) has compiled an exhaustive and an unbiased report on the global adhesion laminated surface protection films market. In this report, the global adhesion laminated surface protection films market has been scouted in detail, encrusting key market dynamics thoroughly. The report readers are presented with insights on trends, drivers, and restraints that determine the course of the global adhesion laminated surface protection films market. The report also aims on examination of data related to multiple parameters, for extrapolating value of the market. Competition landscape of the market is also rendered by the report, along with detailed profiling of prominent market players. First chapter of TMR’s report gives an executive summary of the global adhesion laminated surface protection films market. In this chapter, a snapshot of the market, coupled with most significant market numbers that include historical CAGR for the years 2012 to 2016 and forecast CAGR for the years 2017 to 2026 has been provided. The executive summary also renders information associated with the remunerative markets with respect to the largest revenue share and the highest CAGR. Moving ahead, the report gives an incisive introduction, and a precise definition of the targeted product – adhesion laminated surface protection films. In its subsequent chapters, insights on recent industry trends, macroeconomic factors, and untapped opportunities have been provided, which are likely to impact adoption of adhesion laminated surface protection films in the upcoming years. Some chapters in the report have been dedicated to information about product life cycle, cost structure, pricing analysis, supplier list, and supply chain analysis. Presence of key participants contributing to growth of the market has been illustrated via an intensity map. A segmentation analysis has been delivered on the global adhesion laminated surface protection films market. The market is segmented into industry, solutions, and region. In this chapter, forecast on segmentation analysis is provided, which includes market numbers on the basis of market share, revenue, and Y-o-Y growth comparison. For providing regional analysis of the global adhesion laminated surface protection films market, the report divides the market into six key segments namely, Japan, Latin America, Asia-Pacific excluding Japan (APEJ), Europe, Middle East & Africa (MEA), and North America. In its last chapter, the report provides analysis on the market’s competition landscape. Leading market participants have been profiled in detail by the report in this chapter. Insights on the market participants have been delivered based on product overview, company overview, SWOT analysis, key financials, and key developments. For clients purchasing this report, the competition landscape of global adhesion laminated surface protection films market is crucial, as it offers necessary knowledge for studying the market players’ current market standings, and the way these players are implementing strategies for gaining a competitive edge in the global adhesion laminated surface protection films market. A tested and proven research methodology is leveraged by analysts at Transparency Market Research (TMR), for arriving at revenue estimations associated with the global adhesion laminated surface protection films market. An in-depth secondary research has been employed by TMR’s analysts to reach at the market size, which provides information on major industries’ contributions. Extensive primary interviews have been conducted with industry experts, in order to aggregate authentic data associated with the global adhesion laminated surface protection films market. The data gathered has then been validated with the help of advanced tools for extracting relevant insights on the global adhesion laminated surface protection films market.